Hideo Kojima's major "Tactical Espionage Action" hit for the Playstation, "Metal Gear Solid" was a sequel in the Metal Gear series for the MSX and Famicon. The player controls Solid Snake, whose mission is to infiltrate and stop a number of ESWAT members Fox Hound from finishing their terrorist act on the isle of Shadow Moses. The player must sneak in and avoid guards, killing as few as possible while gradually advancing through the complex. 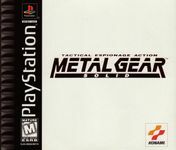 After the huge success, the game was released as "Metal Gear Solid: Integral", where bonus training stages were added. It was later also released on the Game Cube as "The Twin Snakes".